Purchasing tickets for entry at the venue is not only time consuming but often times, futile. Since each time slot for entry into the basilica has limited capacity, same day entry tickets on site tend to sell out before mid-day, even if you waited in line for several hours, as many visitors must do. 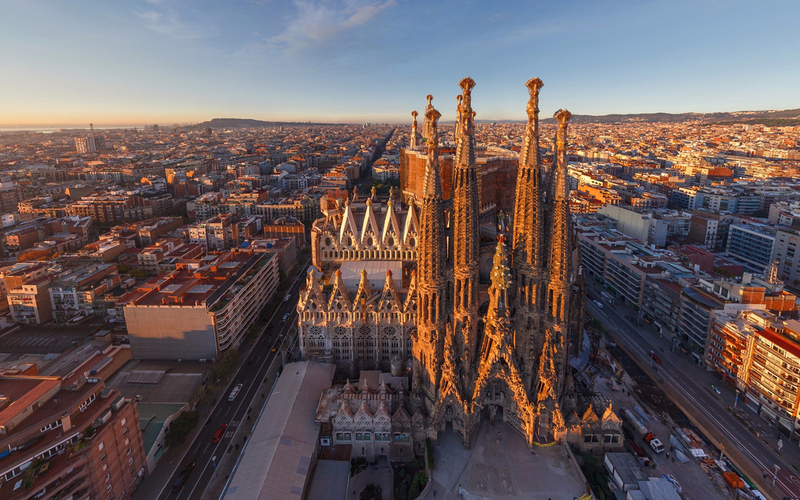 Our fast track Sagrada Familia tickets provide you with priority access to this iconic basilica. Once you book your tickets, you will receive them via email which you can then display on your phone to skip the ticketing line entirely and proceed directly to the security check. Before you head into the inner sanctum of the church, make sure to explore the outer walls and facades of the Sagrada Familia. Two of the three facades, Nativity, and Passion, have been completed, while the third, the Glory Facade, is still under construction. The Nativity facade tells the story of the birth of Jesus Christ while the Passion Facade is dedicated to his death. Though you can admire the facades and towers from the outside, these tickets do not give you access to the towers themselves. If you wish to gain entry to the towers along with the Basilica, please click here. As you move inside, you will come face to face with one of the most enchanting interiors of any church in the world. 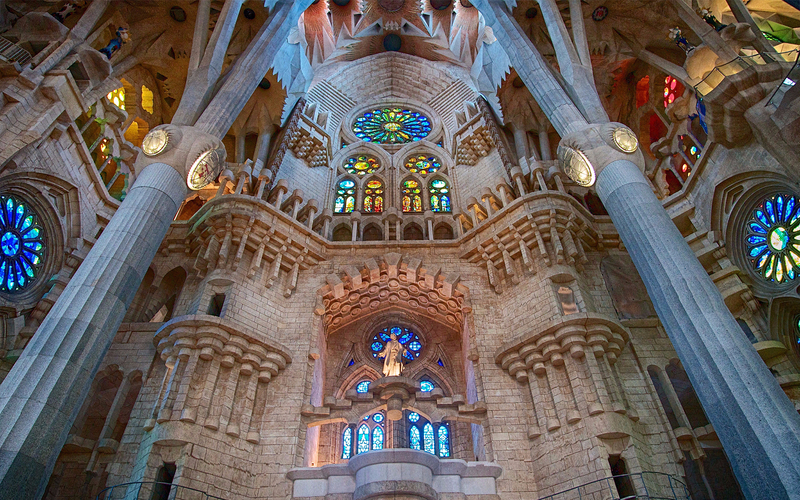 The vaults of the Basilica are as high as 70 meters in certain places and the beautiful, stained glass windows, constructed as per Gaudi’s plans, as well as the pillars holding up the ceiling, make the entire space appear as though it were the hollowed out rib cage of some giant celestial beast. The magical natural light filtering through the basilica’s exquisite windows will take your breath away and transport you to a different time. 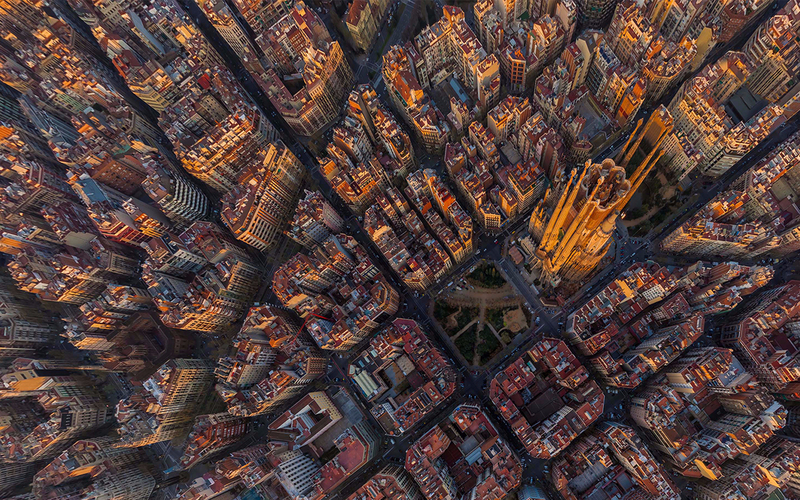 Get a chance to visit the most iconic monument in Barcelona that has been under construction since 1882, this UNESCO World Heritage Site attracts more visitors each year than any other landmark in Spain. With these fast-track tickets that you can book online, you need not worry about the long winding queues and you will also be guaranteed access to an otherwise sold out attraction. Marvel at the magnificent inner sanctums of the basilica with its extraordinary vaulted ceilings and stained glass windows, bound to sweep you off your feet. Groups with more than a total of 9 people, either adults or children, will not be allowed to gain entry into the Basilica. Should you wish to visit with a group of more than 9 people, you must book a guided visit as per the rules of the Basilica. You can book this by clicking here. Entry to the Sagrada Familia is timed. You will have the option to choose the time slot for your entry during the next step of your booking. Please note that you will only be allowed to gain entry at the time chosen during the booking so we recommend arriving 15 minutes in advance in order to ensure a hassle-free entry. Though your entry is timed, you may explore the basilica for as long as you wish. Most visitors spend around an hour and a half inside. Entry for children aged eleven and below is free, however, they will not receive an audioguide. You will have the option to choose the number of children who require free entry at the time of checkout. The main access to the Sagrada Familia is on the Carrer de la Marina (C/Marina). The insides of the Sagrada Familia is wheelchair accessible. However, due to the narrow stairways leading to the towers, tower access is not suitable for individuals with mobility impairments. These tickets cannot be cancelled, amended or rescheduled. 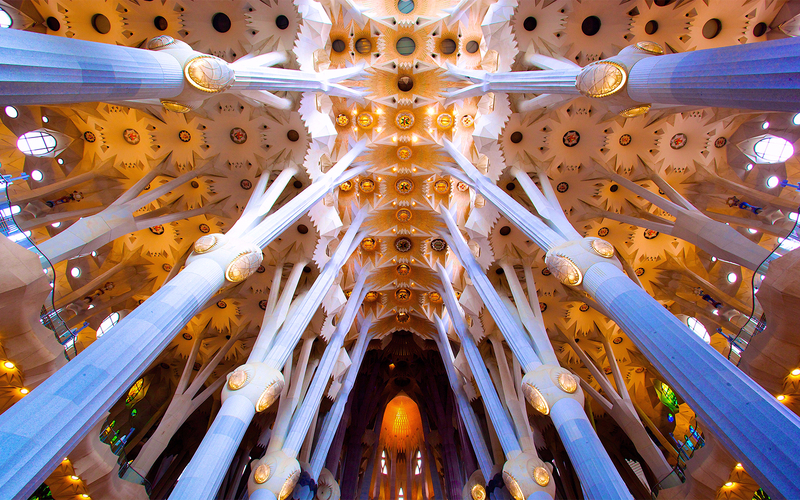 You will receive an email confirmation with your Sagrada Familia mobile tickets instantly. No need to print. You can skip the ticket line and go directly to the security line with your mobile ticket. Skip-the-Line access to the Sagrada Familia.